the light was right, so i took a few snaps of the cottage curtains - they are the cutest fabric ever, but disintegrating (we lost one last month when someone tried to wash them). but i have a plan - i've had a spoonflower account for ages, but haven't done anything with it yet. 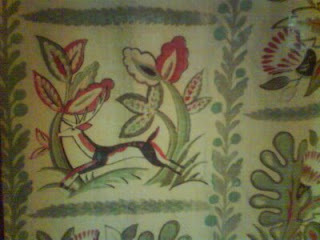 i am going to get a bunch of this deer-and-thistles fabric made so we can re-do all the curtains exactly as was! the time-capsule tradition of the cottage continues. i heard some loons making a fuss so i headed down to the dock with my knitting and saw four of them - two adults and two young - horsing around in the water. a chicakdee came over to where i was sitting, and had a lot to say. soon the rest of the family got up, and we had cinnamon buns (baked by the mennonites in a wood-fired oven!) and strawberry preserves a friend of mine made. we took a short canoe ride and a stroll down the lane and i saw a cardinal. why can't i spend my whole life living like this? seems such a shame that it's only one week a year. please, someone provide me with an income sufficient that i can spend my life knitting and sewing and writing charming blog posts about nature & the changing seasons etc. thx. 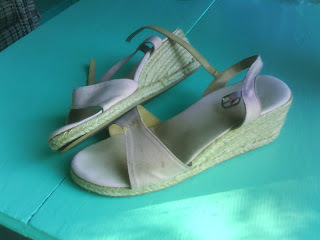 and i got some work done on the shoes project - i got these pink espadrilles for $5 at value village - they'd never been worn! - i'm guessing they were an old-stock donation, and the reason they were never worn is they are somewhat unwearable - the instep strap is the wrong shape somehow and my whole foot always wants to slide right through. 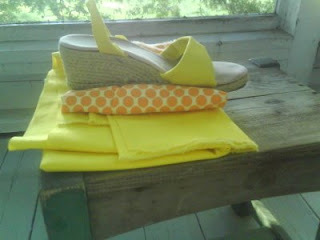 so i've sewn a sort of dart in the instep, and i'm going to recover them - yellow! this is turning out to be one of the more tedious projects i've attempted (which would explain why it's been in the "to do" pile for most of the summer). 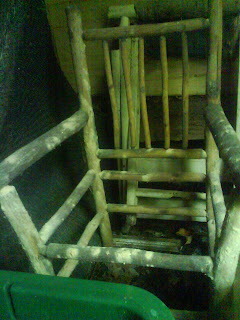 there is one cottage craft that won't happen though - i saw this chair in the shed and thought, perfect for h! all it needs is a seat! and then i had a closer look. see those pale spots? those are small piles of fine sawdust - each around a tiny ant hole. there are lots more holes than show up in the picture, too. a shame - but as long as they choose to eat something expendable rather than the cottage itself, we can't complain! That curtain fabric is incredible.